Like many sports, rowing has a language all its own. For the novice rower who's told to "way enough," or the parent whose teenager comes home talking about "catching a crab during a power ten," it's helpful to know some basics. There are two types of boats or shells used in rowing. In sweep rowing, each rower uses only one oar. In sculling, the rower uses two oars. Sweep boats can have two, four, or eight rowers. Sculling boats have one, two, or four rowers. Each boat may or may not include a coxswain, the on-board captain who steers the boat and controls the tempo. Boats are designated by a number, indicating how many rowers are on board; the letter x to indicate a scull, and a symbol (+ or -) to indicate whether there is a coxswain. Each seat in the boat is numbered from the bow (1) to the stern. Bow: Forward section of the shell, the part of the shell which crosses the finish line first. Also used as the name of the person sitting nearest to the bow (1 seat). The rowers always face the stern. Stern: The rear of the racing shell. The direction the rowers are facing. Starboard: The right side of the shell when moving forward. Oars on the starboard side of a standard-rigged boat are the Bow, 3, 5, 7. Note that for the rowers, starboard oars will be on their left. Port: The left side of the shell when moving forward. Oars on the port side are numbered 2, 4, 6 and 8 (stroke). Seat: Where the rower sits. The seat slides back and forth to enable the rowing motion. Foot Stretcher: The stretcher consists of two inclined foot rests which hold the rowers shoes. The rowers’ shoes are bolted into the foot rests. The stretchers are moveable forward or backward to allow rowers of different leg lengths maximum slide range. Tracks: The set of metal runners set inside the shell, to accept the wheels on the bottom of each rowers seat (slide). Slide: 1)the physical rails upon which the seat rolls, and 2)the part of the stroke when the seat is moving, both during the drive and during the recovery. Rigger: The "arms" attached to the exterior side of the shell to which the oarlocks are attached. The rigger acts as the fulcrum for the oar. Oarlock: The device at the end of the rigger that holds the oar. Rudder: Small, moveable piece on the bottom of the shell by which the coxswain can steer the boat. Skeg: The stationary fin located at the stern section of the boat used to help stabilize the shell in holding a true course. It is not the same as the rudder. Oar: Used to drive the boat forward. Rowers do not use paddles. Sweep oars are longer than sculling oars. Grip: The rubber part of the oar handle that the rower grasps. Shaft: The main part of the oar between the grip and blade. Blade: The wide flat part that contacts the water. (Sometimes oars are called "blades.") Blades are commonly longitudinally symmetrical (spoons) or shaped like hatchet blades (hatchets). Collar: Also known as the button; this is the ring around the sleeve of the oar that is moved to adjust the load on the oar, and the relative length of the handle. The beginning of the stroke when the blade enters the water. The rower is fully compressed (knees bent, arms reaching forward) and the seat is forward on the slide. The blade is fully “squared” (perpendicular) to the water at this time. The part of the stroke cycle where the rower applies power to the oar. This consists primarily of the leg drive, then straightening the back, and finally pulling in the arms. Most of the power in the stroke is accomplished during the leg drive. The blade comes out of the water and the legs are straight and the hands have finished pulling the oars into the body. When the blade comes out of the water it is immediately rotated or “feathered” so that it is parallel to the surface of the water. Rolling the oar handle in your fingers so the blade is parallel to the water. Begins with the hands coming away from the body during the finish followed by the rower swinging the upper body back to a slightly forward body angle position. The rower then moves slowly back up the slide towards the catch. 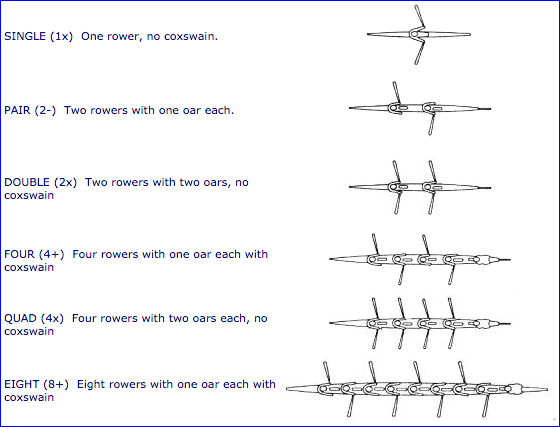 Some of these terms are commends used by coxswains to control the boat. Back or backing: To propel the shell backwards by turning the boat by pushing the handle away from the body while the blade is in the water. Often one side of the boat while the other rows normally in order to spin the shell around. Crab: An accident that occurs when a rower loses control of his or her oar. The rower’s blade gets trapped in the water by the momentum of the shell, and the oar handle flies backwards, going over the rower's head or striking the rower's chest. Often the handle ends up behind the rower (see the photo). In extreme cases, the rower may be thrown overboard. It's called "catching a crab," and sooner or later it happens to everyone. Check it down; hold water: To place the blades of the oars vertically in the water as a means of slowing or stopping the shell. Cox box: An electronic device used by coxswains, consisting of a headset microphone and speakers located through the shell. though which the cox gives commands to the crew. Connected to sensors under a sliding seat, the cox box has readouts that can show speed, stroke rating, number of strokes and time rowed. Ergometer: Better known as the "erg," it's an indoor rower for training. TC Crew uses ergs manufactured by Concept 2. Full slide: Type of stroke where the seat is moved on the tracks, so that the rower used legs, back and arms. Half pressure: The application of power in a racing shell such that the rowers are rowing half as hard as they can at full pressure. The rowers are pulling harder than they would at paddle pressure, but not as hard as if they were rowing at full pressure. 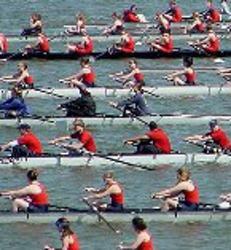 Head race: A regatta in which crews race against the clock over a set distance, rather than side-by-side. The standard head race distance is 3 miles, though it is dependent on the race course. Head races begin in September and last through the fall. 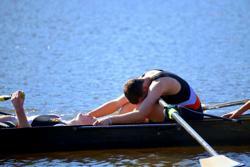 Layback: The rower’s act of leaning back toward the bow during the stroke. Layback should not be more than a few degrees past vertical. Let it run; let her run: A command to stop rowing, holding the blades out of the water and parallel to the surface so the boat continues to glide. Piece: A term referring to any period of work performed in the shell or in training on the ergs: a "ten minute piece," a "500 meter piece," or a "20 stroke piece," for example. Power Ten: A coxswain's command for the rowers to take ten of their best, most powerful strokes - a strategy to pull ahead of a competitor. Puddles: The marks left by the blade on the water after the release. The puddles indicate the “run” of the boat by showing how far it has traveled since the previous stroke. Rating: The number of strokes rowed per minute. Repechage: A "second-chance" race for those crews that fail to qualify for a final from an opening heat. Repechage qualifiers move on to semifinals or finals, depending on the number of entries in an event. Run: The distance the shell moves during one stroke. Good spacing means the crew is letting the boat work while they are on the recovery. By rushing the recovery, the crew will make the shell surge towards the stern immediately prior to catching and shorten the run for that stroke. Rushing the Slide: A technical error caused by sliding too quickly and abruptly toward the stern. Set: The balance of the boat. Settle: The part of the race (or other piece) where the crew decreases the rating from the initial high stroke to a lower pace that the crew will maintain until the final sprint. Skying: The incorrect action of carrying the hands too low during the recovery, especially when the rower dips his/her hands just prior to the catch (i.e. sort of winding up). This action usually results in the blade being too high off the water’s surface. Sprint race: Races in which boats row a set distance in side-by-side competition. Depending on the number of entries, there may be qualifying heats and semifinals to determine which boats row in the final face. The number of boats in a race is determined by the number of lanes on the course, usually six. High school sprint races are 1500 meters (2000 in Canada); college sprint races are 2000 meters. The spring high school racing season is sprint races. Stroke: The rower who sits closest to the stern. The stroke sets the rhythm for the boat. All rowers behind the stroke must follow the stroke’s cadence. Swing: Occurs when the entire crew is moving perfectly in unison and the shell seems to be moving very fast without much effort. Washing out: When the blade comes out of the water during the drive – creating surface waves, losing power and unsteadying the shell. Way enough (also weigh enough): A command to stop rowing, or stop walking with the boat overhead on the dock (used only in the US). These are categories used in competition. Lightweight: In high school crew, lightweight girls cannot weigh more than 130 pounds; lightweight boys no more than 150 pounds. Classifications for Canada are slightly different. Junior: In high school rowing, a junior boat (junior 8, junior 4, etc.) cannot have any rowers who are past their junior year. There are also age limits for junior events in some championship regattas. In the broader world of rowing, junior refers to participants 18 years old and younger. 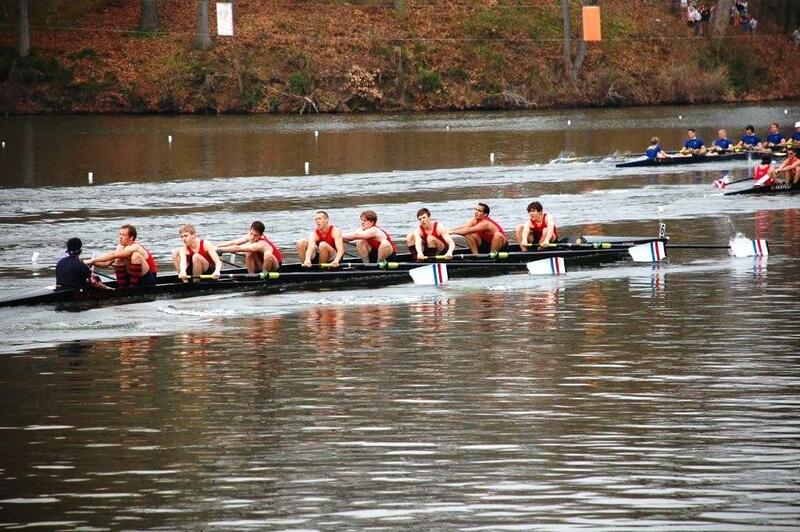 Freshman: Rowers and coxswains in freshman boats must be in the 8th or 9th grade only. Novice: A beginning rower in his or her first year racing. Open: In this category, the rower can be any age, any weight. Masters: This is the category for rowers age 27 and older. It is further broken down by age range.